As a PR student, it’s customary to receive advice from professionals who have experience in the field. It may come in different packaging, but often, it’s an old adage that you’ve heard before around the dinner table. In a recent PRGN webinar about ethics, Anne Green, CEO of CooperKatz & Co. mentions how applicable old adages can be to working in PR. 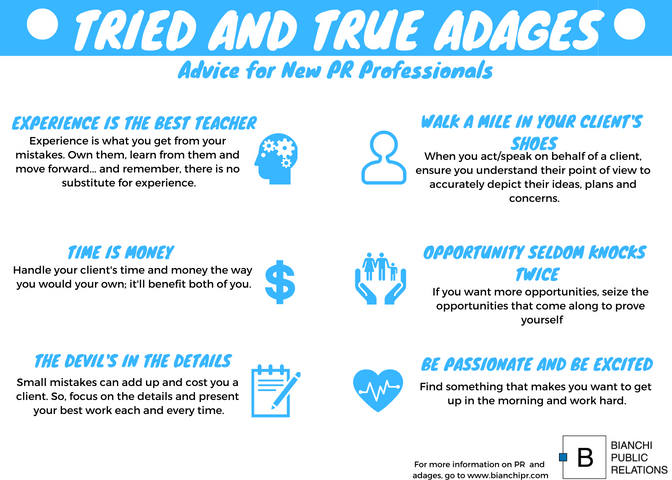 Most of the time, these old adages are filed away until the opportunity to use them again presents itself, but there are a few adages in particular that PR professionals use on a regular basis. Unsurprisingly, they’re most often used because they’re true! 1. Experience is the best teacher. – Making mistakes can be discouraging, especially as an intern or entry-level employee, but there’s always a learning curve in a new position. If you really want to show your boss what you can do, own up to your mistakes, ask as many questions as possible and learn from them so you don’t make the same ones in the future. 2. See through someone else’s eyes, or walk a mile in someone else’s shoes. – Sometimes you have the same concerns as your client, and sometimes you don’t. Either way, when you act and speak on behalf of someone else, you have to figure out what they want and communicate it effectively. Ask questions about the clients’ concerns, be clear in responses and communicate openly to avoid frustrations. 3. Constant vigilance – Maintaining a concise, accurate understanding of what’s happening in your industry allows for complete transparency between you and your clients. It puts you at the forefront of the barrage of concerns that come up. Furthermore, it pays to keep an eye on the news for opportunities that may affect clients. 4. If you don’t want it on the front page, don’t do it. – Does it paint you or your client in a bad light? Will it get an undesirable response? Will you be able to maintain control of the coverage? Even if your company isn’t responsible for promoting the coverage, make a plan for the inevitable consequences. 5. Time is money – Always handle your clients’ time and money the way you would handle your own. It’s in both of your best interests. 6. Death by 1,000 paper cuts – Too many small mistakes add up. You’re at risk for losing clients and job opportunities if you don’t do everything you can to ensure you, your colleagues and your employees are doing quality work 24 hours per day, 365 days per year. 7. The Devil’s in the details – The client is paying you for a service you do for a living. The details are what make the work worth your time and the client’s time. Get it done, get it done well and move on. 8. Opportunity seldom knocks twice. – If you want a client, a job, a task or a promotion, and you turn it down for any reason, don’t be surprised when it doesn’t come back around. Also, don’t expect new opportunities to present themselves in the first place if you don’t do your best work. 9. No man is indispensable. – Like it or not, there is someone out there with the same skill set as you who does the same job for the same price or lower. You’re not irreplaceable, despite your resume or recommendations. 10. Be passionate and be excited – If you don’t love your job, or even like your job, you might be in the wrong profession. Find something that will keep you motivated to work hard for clients and for yourself.